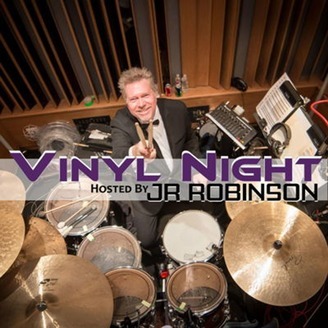 The Vinyl Night radio show features some of the best and most influential people in the music industry. Each week will feature an intimate, candid and in depth one on one interview with drummers, guitar players, bass players, keyboard players, recording engineers, singers and producers. All of these great artists contributed to music that changed the world. 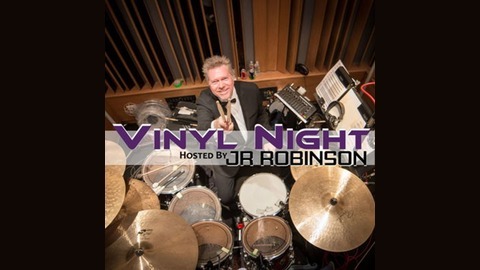 JOHN “JR” ROBINSON has become the most recorded drummer in history. Some of the hits are, We Are The World, All Night Long, You Are and Say You Say Me by Lionel Richie, I’m So Excited and Slow Hand by the Pointer Sisters, I’m Just A Gigolo and California Girls by David Lee Roth, Higher Love, Express Yourself by Madonna, Off The Wall, Don’t Stop Til You Get Enough, Rock With You, The Way You Make Me Feel, Smooth Criminal from the late great Michael Jackson and many many more! RANDY KERBER is a composer, orchestrator, and keyboard player, who has had a prolific career in music. He began his first national tour with Bette Midler in 1977, at the age of 19. Kerber was nominated for an Oscar in 1986, along with Quincy Jones and others, for Best Original Score for the motion picture, "The Color Purple". He was nominated for a Grammy for his arrangement of Over the Rainbow for Barbra Streisand. As a studio keyboardist, he has worked on over 800 motion pictures including "Titanic", "A Beautiful Mind", and "Harry Potter I, II, & III". The piano in "Forrest Gump" which features a feather floating in the wind, was played by Randy Kerber. The celeste theme in "Harry Potter", composed by John Williams, is also played by Randy Kerber. Most recently, Randy has performed piano solos on Steven Soderbergh's "Behind The Candelabra" for which he also trained Michael Douglas. As a studio keyboardist, Randy has been an orchestrator on over 50 films, including work with Academy Award winner James Horner. He worked with Eric Clapton as keyboardist, orchestrator, and conductor on the film Rush - playing on the Grammy Award-winning song "Tears in Heaven". During his career, Randy Kerber has worked with a wide range of artists such as Michael Jackson, Paul Anka, Leonard Cohen, Rickie Lee Jones, Whitney Houston, Michael Bolton, Rod Stewart, B.B. King, Bill Medley, Annie Lennox, Art Garfunkel, Celine Dion, Natalie Cole, Al Jarreau, Ray Charles, Neil Diamond, Barry Manilow, Don Ellis, Ricky Martin, Bette Midler, Kenny Rogers, Donna Summer, George Benson, Diana Ross, Frank Sinatra and Dionne Warwick…Recently, Randy Kerber has performed piano solos on Steven Spielberg's Lincoln, Robert Zemeckis' "Flight", “Fragments de Amor”, Star Wars, “The Force Awakens” and “LA LA LAND”.